Photos shown here are selected examples for a project called "Navy Tour." These frozen bits of time played before my camera from 1966 to 1970 when I served as a Navy photographer. An on-going project to decorate California Veterans Homes unexpectedly brings memories to light. Below, I've organized images into location-based galleries that follow my Navy travels. Over the years, these old negatives have called to me like whispering ghosts from closed boxes and dark places where they've languished for 40 years. It’s as if my old photographs have something they wish to say. I say, let them speak. On the mud flats of the Sheepscot River in Wiscasset, for a century, the ships Hesper and the Luther Little wait. I arrive in a storm with camera in 1968. But, I print this negative for the first time in 1969 at Sangly Point in the Philippines. Navy photographer Ron Letarte, who happens to be from Maine, sees the image and loves the glimpse of home. 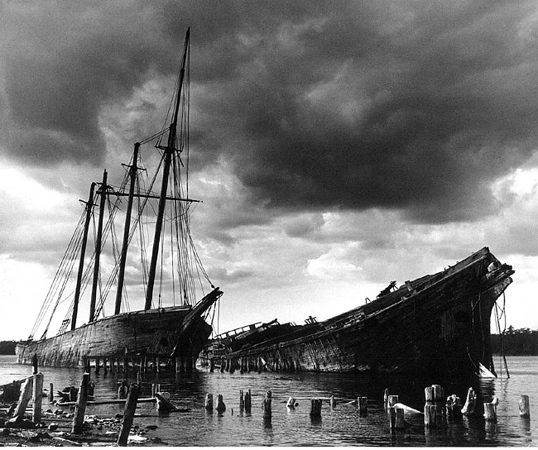 Years later, a storm destroys the ships and Letarte tells the story to a newspaper friend. I send him a print. The local paper runs this picture 35 years after I snap the shutter.